The good news is that most antiques and collectables are not significantly radioactive, and the ones that are, are usually fairly easy to spot. For example, clocks, watches, compasses and instruments with luminous dials are immediately suspect, especially if they were made prior to the 1950s when the use of radium paint was discontinued. A. Some items are helpfully labeled as being radioactive. 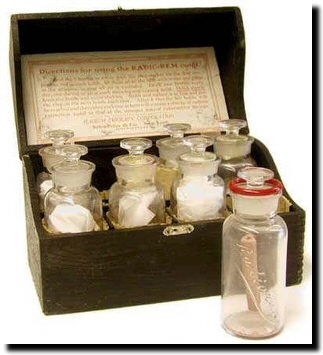 Soon after its discovery by Marie Curie in 1898 radium became a popular ingredient in a wide variety of quack therapies, treatments and remedies: these should be handled with great care as the radioactive materials can escape or may have deteriorated. Always seek expert advice if you have any safety concerns. In the UK the place to begin is the Health and Safety Executive. 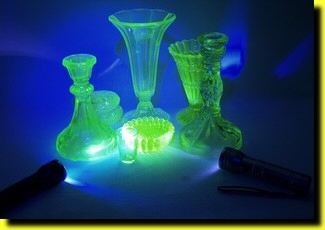 Radioactive glass and ceramic items are not so easy to identify, though green or pale yellow Vaseline glass, also known as Depression glass or Uranium glass, popular in the 1920s and produced until the 1950s, has a distinctive lustre in sunlight, and usually glows or luminesces strongly when exposed to ultraviolet light. Q. 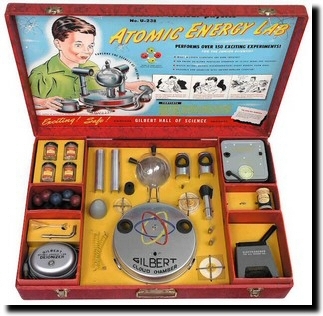 How harmful or dangerous are radioactive antiques and collectables? A. There’s no easy answer; it’s a little known fact that virtually everything, including you, the food that we eat, the air that we breathe and the rocks beneath our feet are radioactive to some extent. This is perfectly normal: it has been that way since the beginning of time, and we have evolved to live with it. 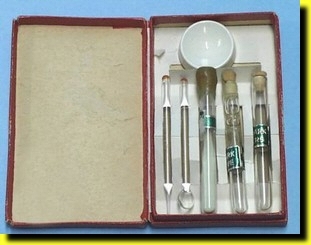 The typically small amounts of radioactivity that may be found in some antiques and collectables tend to produce readings that are only a little higher than normal background levels and are generally not considered to be harmful. 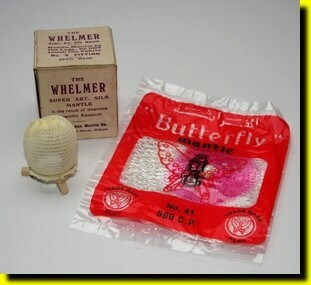 Nevertheless it is wise to take precautions when storing radioactive items, and of course they should be kept well out of the reach of children – as you would with any fragile item. The radioactive materials in glass and ceramics are in low concentrations and contained within solid masses and therefore unlikely to ever find their way into our bodies – where it can become a problem. But there are exceptions. The most notable one is luminous radium paint. Over time it can deteriorate and produce fine dust particles, which could be harmful if ingested. It’s unlikely to happen if the item is intact but if it is dismantled or damaged the particles may be released. Clearly, extreme care should be taken in the handling of such items and if you are in any doubt as to their safety you should seek expert help or have it safely disposed of by a company licensed to handle hazardous materials. There's a lot of it about, including antique ceramics. Fiestaware was popular in the US and some of it reached the UK. From the mid 1930s to the early 40s its vivid orange glazes contained quite significant amounts of radioactivity. Uranium, Vaseline or Depression glass also contains trace amounts of Uranium Oxide and is very widely available. Bagley in the UK was one of the most prolific manufacturers from the early part of the 20th century and it's green Carnival range can often be quite 'hot'. There are plenty of other examples, including some Waterford Crystal and glass and ceramics from many well known makers dating from the late nineteenth century to the 1950s; many old clocks, watches, aircraft gauges, compasses and scientific instruments have radium painted luminous dials can really get some Geiger Counters ticking! So how do you tell what is, and is not radioactive, and what are the health and safety implications? The good news is that most of the items you are likely to come across are generally harmless and legal to own and sell; but there are exceptions. Unfortunately you cannot see 'ionising' radiation, but we at anythingradioactive with our range of sensitive radiation monitors and Ultraviolet torches. UV torches do not actually detect radioactivity but they can indicate the presence of Uranium Oxide in glass and ceramics by making it glow or fluoesce in the dark. Needless to say if you come across something you are n ot sure about or have any concerns contact your local authority's health and safety department or the HSE (link opposite). Brilliant red and orange Fiestaware from the 30s and 40s is known for having a detectable amount of Uanium Oxide in its glaze, which produced the orange-red colour. During World War II, the US government took control of Uranium for development of the atom bomb, and confiscated the company's stocks. Red is not the only colour of vintage ceramic glaze that is radioactive; it is detectable from other colours, including ivory. There are lots of ways, many involving the use of complex and expensive instruments that require expert knowledge in order to use. However, one of the simplest, cheapest and easy to use methods is to use a device known as Geiger Counter or Dosimeter, which detects the commonest types of radioactivity (see our Rough Guide to Radioactivity). 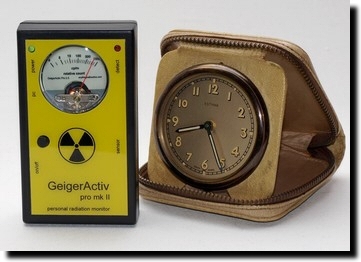 Providing a Geiger Counter is sensitive enough to react to normal and naturally occurring background radiation, it should be able to clearly indicate higher than normal levels when bought into close contact with a suspect item. If you have any old clocks, watches, compasses or instruments with luminous hands or dials and they were made prior to the mid 1950s, then there is a very fair chance they could contain radium paint, and this can produce a quite dramatic response, even from our most basic detectors. 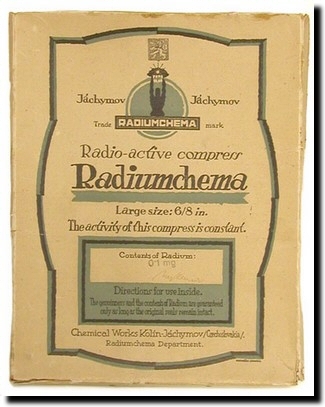 Care should be taken in the handling of these items, though, and do not try to dismantle them as the radium paint is often old and flaky and liable to produce dust, which can become airborne and could represent a potential health hazard if inhaled or ingested.